When it comes to the potential for digital health to radically improve chronic medical conditions, diabetes leads the discussion. Despite being an obvious market and the existence of literally thousands of apps claiming to assist with diabetes management, the diabetes app market remains relatively immature, with no clear dominating market leader. Therefore, researchers in Germany conducted a systematic review of diabetes apps for iOS and Android to assess the options currently available on the market (as of April 2013), looking specifically at cost/functionality/target market. Furthermore, given the fact that a majority of the diabetic population is over 50 years old, they additionally performed a focused usability assessment for the elderly on a 10% representative sample of the market. The authors conducted their survey between the months of February and April 2013, focusing on Diabetic search keywords (glucose, diabetes, blood sugar) in both the iOS App Store and Google Play Store. It’s worth noting that this review took place over one year ago, and the market has likely undergone further evolution, even since that time. The study included 390 apps in the iOS app store, and 380 for Android. Since 114 of these apps supported both platforms, 276 were iOS-only and 266 supported Android alone. 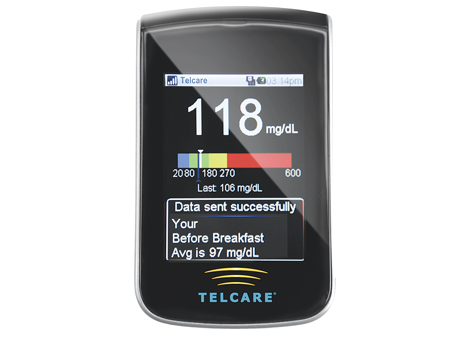 The first diabetes app (Glucose-Charter, for iOS) was developed in 2008, along with a total of 5 other diabetes-related apps. The number of diabetes-related apps developed per year (see graph above) shot up to 267 in 2012, and 149 new apps were released in the first four months of 2013. It would be curious to see whether that number has continued to balloon, or if market saturation has finally taken place. Not surprisingly, a clear majority (172/276, 62.3%) of iOS-only apps required payment, whereas the majority of Android (169/266, 63.5%) and Android/iOS (79/114, 69.3%) apps were free. The median price for iOS-only apps (1.8 Euros, $2.46) were slightly higher than their Android-only counterparts (1.5 Euros, $2.05), but the median cross-platform app price (2.3 Euros, $3.14) was higher than any single OS-supporting app. The authors did not directly correlate cost to app quality or feature set, but they did analyze whether paid apps received higher ratings in their respective App Store. While free apps did not receive lower ratings than paid apps as a whole, more expensive apps received more stars than less expensive apps. However, once the app cost rose above 5 euros ($6.82), the number of stars began to decline. The study then looked at the number of functions each app supported, breaking down the functions into the following categories: documentation (entry of glucose values), analysis (interpretation), information (diabetes teaching), communication (exporting reports), reminders, recipes, and advisory (therapeutic support). 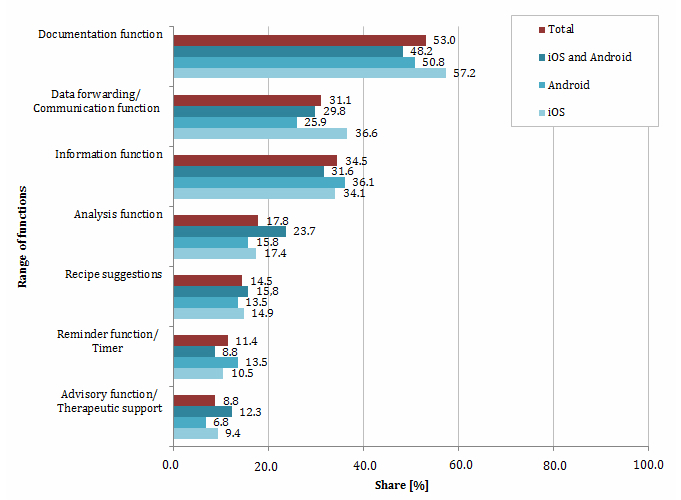 54% of these apps were limited to one function, with documentation (via glucose log) being the most common feature, being found in 348/656 (53%) of total apps. Most apps required manual data input, although they did find a small selection of apps (30/656, 4.6%) that synchronized with online platforms or via Bluetooth. Regarding target users, an overwhelming majority (630/656, 96%) of the examined apps were designed specifically for patients, with 24/656 (3.7%) supporting both patients and qualified health personnel. They found 50/656 (7.6%) apps were designed specifically for qualified health personnel. A significant portion of the study focused on usability of diabetes apps in the elderly (curiously defined as >50 years old), studied with an expert-based usability evaluation of various broad criteria within a representative 10% sample. The broad criteria categories included comprehensibility, presentation (image and text), usability, and general characteristics. For the most part, each app assessed received a moderate to good rating within each criteria, although the apps generally seemed to suffer most when it came to “Fault Tolerance” (defined as simplifying data entry to prevent erroneous data entry) as well as “Simple Recognition of Click-Sensitive Areas,” (defined as a simple distinction between click-sensitive and non-click-sensitive areas). Interestingly, the authors discovered a negative correlation between usability scores and the number of features, with the addition of glucose-logging functionality having the largest negative impact on usability. As an endocrinology fellow, the primary reason I chose my subspecialty is for the potential of digital health when it comes to diabetes/metabolism management. In addition to general market research, I applaud studies such as these for helping to improve the medical legitimacy of digital health solutions. Like these authors, I agree that despite the abounding number of options on the market, significant barriers to entry remain for diabetes-related smartphone apps. For example, manual data entry and insufficiency usability for older patients. Despite these barriers, I remain optimistic in the growing number of wireless syncing glucometers (eg Verio Sync, Telcare), and the future innovation of digital health leaders to revolutionize lifestyle management. Nice article! One question though: what would a diabetes app have to do that the others aren’t doing to actually achieve the goal of improving patient care? I know a lot of people with diabetes but I don’t know anyone who has said “This app is amazing, it has improved my diabetes self-care”. What’s the solution?